If you need to haul a major load of people or cargo, the larger, smoother R-Class crossover or the big, rugged GL-Class SUV might be more to your liking. It ain’t cheap, but the 2009 Mercedes-Benz M-Class deserves its place atop the luxury SUV echelon. TheCarConnection.com's editors drove the new Mercedes-Benz M-Class in order to give you an expert opinion. TheCarConnection.com's SUV experts researched available road tests on the new Mercedes-Benz M-Class to produce this conclusive review and to help you find the truth where other reviews might differ. The 2009 Mercedes-Benz M-Class sport-utility vehicle has gained a number of minor appearance changes that give it a slightly more sophisticated overall style. At the fore of the vehicle, the restyling begins at the front bumper incorporating new headlights with a distinctive brow that trims the top of a larger, lower grille bearing three silver ribs. Angular air intakes, widely set fog lights, and chrome trim are also new features of the ML’s redesigned front end. In back, the M-Class receives a stainless-steel skid plate that wraps around dual exhausts and a recontoured rear bumper with recessed reflectors. The 3.5-liter gas V-6 produces 268 horsepower and gets fuel economy of 15 mpg city, 20 highway. 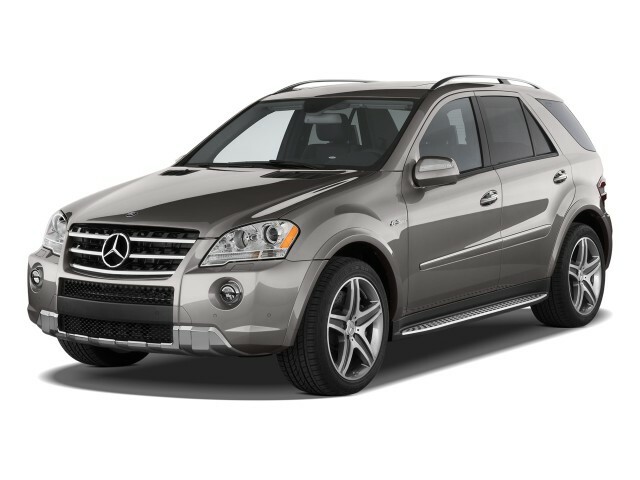 Next up is the 2009 Mercedes-Benz ML550, which wears some of the AMG model's body add-ons. A 5.5-liter V-8 grants it 382 hp, and a seven-speed automatic ushers out the power urgently and smoothly. This version can accelerate to 60 mph in 5.6 seconds, or faster than some two-door sports cars—but it gets 13/18 mpg. At the top of the ladder, the 503-horsepower Mercedes-Benz ML63 AMG remains unchanged, with unapologetic 11/14 mpg fuel economy and supercar performance cloaked in its handsome, neatly detailed body. Under the hood of the new 2009 Mercedes-Benz ML320, the German manufacturer’s BlueTEC clean diesel engine replaces the old ML320 CDI engine. The BlueTEC engine, in conjunction with the new AdBlue exhaust treatment system, meets emission standards in all 50 states, and gets 20 to 30 percent better fuel economy than its gas-powered counterparts, while producing 210 horsepower and 398 lb-ft of torque. It can run upward of 600 miles on a tank, securely devouring interstate at impressive rates in virtually any weather. The diesel feels just as strong as the V-6 in most cases, while also being the best choice out of all the engines for towing. On-road handling is the opposite of what you might expect: The steering is communicative, the ride is pretty well-controlled for a capable off-roader, and braking is good. The 2009 Mercedes-Benz M-Class comes equipped with full-time four-wheel drive and three mechanical differentials, which keep the ML planted on light off-roading, and even some of the hard-core stuff the Jeep crowds crow about. It helps that the ML550 sits on 255/55R-19 tires and wears big 13.8-inch front brakes and 13.0-inch rear vented discs. It can tow 7,200 pounds. The front- and backseats have good headroom, and even in back, there's plenty of adult-sized space. There is no third-row seat option; that's the job of the larger GL-Class ute. In overall size and room, the 2009 Mercedes-Benz M-Class is more than competitive with the likes of Ford's Explorer, Jeep's Grand Cherokee, and their ilk. Its wheelbase is 114.7 inches and overall length is 188.5 inches. With the rear seats folded down, cargo volume is 72.4 cubic feet and 29.4 cubic feet with the seats upright. Stability control, anti-lock brakes, and traction control are standard, along with front, side, and curtain airbags. The 2009 Mercedes-Benz M-Class has a NHTSA five-star crash rating and a four-star rollover rating. PRE-SAFE, a safety system that senses collisions before they happen, is also now a standard feature on M-Class models. For 2009, the COMAND screen-driven interface is all-new, featuring a larger 6.5-inch display screen with a standard in-dash, six-disc CD/DVD changer and a Bluetooth interface. The COMAND screen can display maps and directions for the optional GPS navigation system stored on the larger hard drive. The navigation system is now set up for Sirius traffic info and Zagat restaurant ratings. An optional 610-watt digital Harman Kardon Logic7 audio system and a rear-seat entertainment system with two 8-inch screens, wireless headphones, and an integrated DVD player with dual-source capability are also available on 2009 M-Class models. For the driver, there’s four-stage power lumbar support and a new four-spoke steering wheel with multifunction buttons and shift paddles. The basic shape of the 2009 Mercedes-Benz M-Class is a handsome SUV silhouette with an arcing roofline. The 2009 Mercedes-Benz M-Class doesn’t get a complete redesign, just a few nips and tucks here and there that altogether give it a slightly fresher look. The 2009 Mercedes-Benz M-Class has gone from brickbats to bouquets. Back in the late '90s, the car featured what Car and Driver describes as "minivan-like styling." In 2009, Mercedes-Benz combats that image by sharpening the exterior lines and imparting a certain degree of toughness to its luxury SUV, resulting in "more aggressive styling," according to Edmunds. MotherProof says, “Like its siblings, the ML320 wins me over in the looks department… The grille is an interesting feature; its hole-punched chrome makes the ML look modern and kind of aggressive. It’s a nice balance with the rest of the car, which is smooth and lean-looking. The ML320 looked like it had a lower profile despite the doors being nice and tall.” Kelley Blue Book remarks that "the sleek 2009 Mercedes-Benz ML looks particularly menacing wearing the new ML550 trim." Other reviews read by TheCarConnection.com agree with this sentiment, praising the aggressive, new AMG-influenced styling of the ML550. When it comes to the cabin, Edmunds says “the Benz's interior design and quality may be its most outstanding feature. Compared with the rival Lexus RX 400h, the ML320 feels (and is) thousands of dollars more expensive.” The inside styling of the 2009 Mercedes-Benz M-Class is luxurious, but the car's capabilities as an off-road vehicle are not ignored. Kelley Blue Book is quick to point out that the "padded rails at the bottom of the center console...are more of an off-road touch than [they] expect from the more street-friendly" M-Class. The BlueTEC diesel engine seems to be a winner for the 2009 Mercedes-Benz M-Class, but the AMG is still the most thrilling. The seven-speed automatic transmission that’s offered across the M-Class line earns high marks from reviewers. Adding to the M-Class's performance credentials are superb brakes and an adaptive damping system that improves stability and minimizes body roll during turns. The V-8-based ML550 generates 382 hp and has no problem getting the most from each and every one of them. 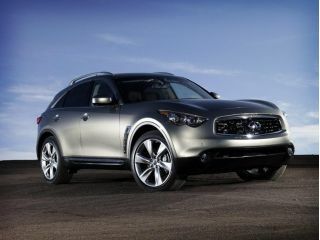 Car and Driver finds the ML550 "to be seriously quick, hitting 60 from a standstill in 5.4 seconds." This version gets 13/18 mpg. The top-end ML63 AMG with its hand-built 503-horsepower engine defies all established SUV speed conventions. ForbesAutos raves about the ML63's "blistering straight-line speed" and notes that the "hand-built engine spurs the big Benz to 120 or 130 mph with ridiculous ease." Its 11/14 mpg fuel economy is unapologetic. Though some reviewers clearly feel that the V-6 ML350 requires too much of a compromise, Kelley Blue Book differs, stating that "opting for the lower-priced, higher-mileage ML 350 won't leave you feeling short-changed in the power department." Both ride comfort and interior quality in the 2009 Mercedes-Benz M-Class are incredibly impressive. High-quality materials are complemented by ample seating space in the 2009 Mercedes-Benz M-Class. ForbesAutos states that inside the M-Class, “there’s just less than 30 cubic feet of cargo space behind the rear seats, and a touch over 72 cubic feet when they’re folded down, which is about average for this class.” Compared to the Lexus RX 350, Edmunds counters, “Passenger room is especially impressive, as the ML affords rear-seat passengers more than 39 inches of legroom—nearly 6 inches greater than the RX 350 offers.” In overall size and room, the 2009 Mercedes-Benz M-Class is more than competitive with the likes of Ford's Explorer, Jeep's Grand Cherokee, and their ilk. Its wheelbase is 114.7 inches and overall length is 188.5 inches. With the rear seats folded down, cargo volume is 72.4 cubic feet and 29.4 cubic feet with the seats upright. Filled with safety features and designed to withstand even the most severe crashes, the 2009 Mercedes-Benz M-Class gets top ratings for crash protection. The 2009 Mercedes-Benz M-Class scores highly in standard safety equipment—and in government and industry crash tests. A strong combination of high-tech safety features and top marks on all crash tests lead the Insurance Institute for Highway Safety to award the 2009 M-Class its Top Safety Pick award. The 2009 Mercedes-Benz M-Class has a NHTSA five-star crash rating and a four-star rollover rating. Kelley Blue Book particularly likes the 2009 M-Class's "Pre-Safe system that tightens seatbelts and closes windows when it senses an impending collision." Stability control, anti-lock brakes, and traction control are standard, along with front, side, and curtain airbags. Edmunds also notes that the 2009 Mercedes-Benz M-Class comes standard with "hill descent/ascent control and a full complement of airbags." The luxurious interior of the 2009 Mercedes-Benz M-Class is what you'd expect from a vehicle in this segment, although the COMAND interface still isn’t loved by all. The 2009 Mercedes-Benz M-Class pours on standard equipment—and gets truly lavish with its options. ForbesAutos, meanwhile, notes the AMG edition gets a special add-on: “The special AMG instrument cluster has a lap timer so you can keep track of precisely how long it takes to run errands around town.” In the top-end ML63 AMG, ForbesAuto also loves that the "tremendous AMG sport seats are wrapped in Nappa leather with suede-like Alcantara inserts." The AMG edition adds a DVD navigation system, a wonderful Harman/Kardon sound system, and three-zone climate control system as standard gear. Great vehicle, ride quality is superb. Wish it had more updated technology. Drives as well as any brand new Suv.